Dayton area artist Judith Key makes Brotherly Love necklaces to share with others who do something nice for another. Key is donating handmade necklaces to the local Habitat for Humanity to help raise funds for housing for local families. 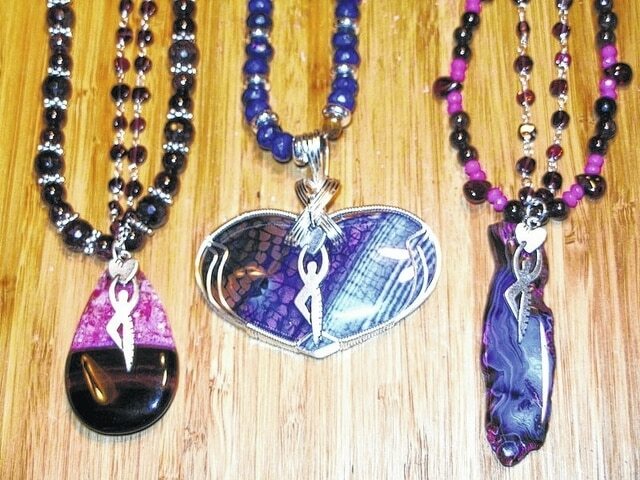 Courtesy photo Judith Key’s handmade necklaces are about 20 inches long and are made from real gemstones. A former St. Paris artist is sharing the spirit of brotherly love and helping the local Habitat for Humanity by donating handmade necklaces for sale. Artist Judith Key, formerly of St. Paris, was dismayed by the anger and hatred in the United States that has been on display for the past several years. She thought she could do a small part to mitigate it by recognizing selfless and kind behavior through the giving of “Brotherly Love” necklaces. The 73-year-old Key, who has spent the past 50 years as an artist, switched to making jewelry from oil paintings and portraits as she got older. She started making the Brotherly Love necklaces about 1.5 years ago, giving them away to people she sees doing something nice without recognition in her everyday encounters. Key, a longtime friend of Champaign County Habitat for Humanity Executive Director Marcia Ward, gave her a necklace for something she had done, and Ward gave it away. Ward thought it may be something that could be useful in her role at Habitat, bringing awareness to what the organization is doing and drumming up donations for housing projects. Ward said the necklaces are sold for $50, which goes into Habitat’s “Brotherly Love” fund. The necklaces have been so popular that Ward said she cannot keep them stocked. The money donated so far has purchased appliances for the Habitat house on Twain Avenue. Key donates her time to make the necklaces and donates the materials for the necklaces. And, Ward keeps the Brotherly Love aspect of it intact. She tells donors about the purpose of the necklaces and asks them to give them to someone who does something nice for another, then tells them about passing on the necklace. Ward said the sentiment has a religious undertone, but that the giving of the necklaces goes beyond religion. “It’s not about the church. It’s about just being kind to people and helping them,” she said. Key said she has made about a dozen necklaces so far for Habitat in the past few months. Each necklace is handmade and all incorporate a “Brotherly Love” charm, a heart-shaped charm with a stylized person holding the heart. The necklaces are generally 20 inches long, but are various sizes, Key said. Sometimes they are wrapped in silver wire; sometimes they are double necklaces. All are made from real gemstones. They vary in shape and color. Key said it takes her about a day to complete a necklace. Key, who has lived through the Vietnam War and the Civil Rights movement, said she recognizes the anger still present nationally, despite some progress. Key said she was devastated when she heard of the shootings of nine congregants at the Emanuel African Methodist Episcopal Church in Charleston, South Carolina. “It just shows what hatred is boiling underneath the surface of our nation,” she said. Key said she will continue to hand out necklaces to others doing good things in the community, hoping to spread good will and encouraging others to do the same. She said she has handed out an estimated 50 necklaces so far. “People really pay attention to it, to the thought behind it,” she said. Key said she presented firs lady Michelle Obama with one of the necklaces when she met her. “Skin color doesn’t matter. Nothing matters. God made us all and we’re all the same to him,” Key said.